For the most part, every commercial and casual drone are considered to be quadcopters. These are defined this way because they have four blades which stabilize the device and act as the momentum for flight. 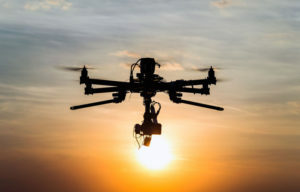 However, while we are in the drone business, part of what helps manage people’s expectations versus the actual capabilities of the drone is to lay out the schematics of the drone. First, to help explain how the different working parts of the drone operate, we should define the parameters of functionality for the drones. First, drones can only move up. They stabilize and gravitate in an upward motion. There is a motor that slows down different propellers to shift the amount of power in a certain direction, but for the most part, they only move up. The payload often a camera, but as Amazon has shown, can work for small parcels; rests in a cradle beneath the drone. This payload is tethered either with a screw or straps, but that’s a story for a different time. Frame and Battery Compartment – First there is the frame. A lightweight, strong material frame will house a battery compartment and the internal circuitry that programs the propellers and anchor the cradle to the system. Propellers – Often four propellers are equally spaced out from the frame and connected to the circuitry. These will usually be a strong plastic material with dulled blades to prevent possible damage. Motor – What makes the movement so crisp for drones are the motors. Depending on the model and layout, there will either be a central motor connected to the circuits, or a small motor for each propeller. This allows for much more precise moving. Cradle – The cradle rests beneath the frame and can act as a potential counterweight. Depending on the size of the drone, you could place anywhere from a camera to a small package at the rate for transportation. 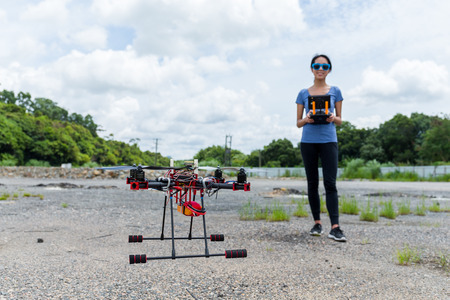 Landing Gear – There will usually be a set of legs or padding on the bottom of the drone to make it easier for the drone to land on solid ground. Depending on the model and the style, it can range from a few inches to a few feet. Compass & Receiver – There will be small markings and possibly a cardinal style compass on your drone. The markings will be the receivers which make it easier to transmit information to the drone while the compass will maintain the drones sense of direction. At Falcon Air Vistas, we are constantly on the rise to being the best Aerial Photographers in Florida. If you would like to learn more about our products or services, please give us a call today at 786-372-6298.